In this step, you will use form iiiFRM03 to call iiiFN07 (your client function), which will in turn send an XML request to iiiFN06 (the server function) via the service you created in exercise INT007. The client function iiiFN07 will then process the server's response and return it to the form to be displayed to the user. 1. You should either be using a local web server and JSM Server or have the file: jsmcltdta.txt configured to point to the JSM Server on an IBM i. You must have checked in and compiled functions iiiFN06 and iiiFN07 if using the IBM i server. 2. Execute your form iiiFRM03 – Display Department Employees. 3. 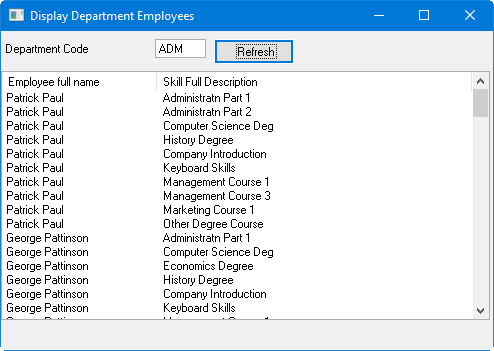 Enter department code ADM and click on the Refresh button.